For the purposes of this blog series, we will consider writing itself as a form of dialogue. In fiction and creative nonfiction, this dialogue has three layers at work within it. The most basic layer is the one everyone thinks of when they hear the word “dialogue”: Character to Character. This is the back-and-forth exchange we see on the written page. It can be verbal or non-verbal, including hand gestures, facial expressions, letters, and so forth. In short, this layer involves anything one character does to communicate with another. The second layer is Narrator to Reader. This includes exposition and narration and consitutes the Narrator and the Reader interacting across the fourth wall. Obviously this dialogue is one-sided. The Narrator will not hear anything the Reader says. Sometimes a Narrator will prompt what they assume the Reader is thinking (“Oh, you were wondering about XYZ? I was just getting to that,” and so forth), but these prompts feel disingenuous because most readers aren’t thinking along those exact lines. The Narrator to Reader layer of dialogue controls the POINT OF VIEW. This powerful story element is a built-in mechanism for manipulating the Reader’s perceptions and how they receive the string of events in your plot. This layer also conveys SETTING and CHARACTERIZATION. Because the Narrator determines which conversations the Reader receives and which character interactions get featured or skipped, the Character to Character layer of dialogue depends entirely upon this layer. 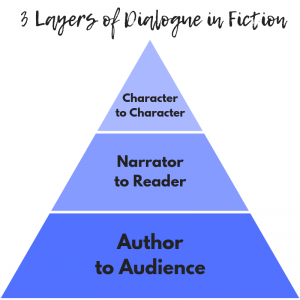 The final layer of dialogue is Author to Audience. The Author is not the Narrator, and neither is every Reader your Audience. As authors this is our most important layer of dialogue, the foundation that upholds everything else. This is the layer of conscious literary choices. PLOT, THEME, diction, analogies, metaphors, and other literary devices all combine to communicate some greater message to the Audience, to manipulate thoughts and feelings. This layer exists whether you acknowledge it or not. It is driven by what you hope to achieve as an author writing your work. ­The Author promises to entertain. ­The Audience agrees to suspend disbelief. Every genre has a specialized version of this agreement. The Romance author promises deep emotional connections between characters, the Suspense author promises tension, the Fantasy author promises wonder and adventure, and so forth. And each of these genres has an audience seeking fulfillment of those promises. Not an intelligent person in the world picks up a novel and says, “If this isn’t straightforward and predictable, I’m going to riot.” Even the audience for the trope-iest of trope genres wants to experience those tropes in an original way, with a fresh perspective and the promise of surprise. Hence, Author and Audience enter a dialogue of deception, built upon mutual consent. If the Author fails their promise, the Audience will drop their side of the agreement as well. In a nutshell, it is your job as an Author to deceive your Audience. As an Author, what specific promises does your agreement with your Audience include? What tropes or other literary devices might help you fulfill those promises? What point of view does your current work-in-progress use? How does this POV help or hinder your Narrator?